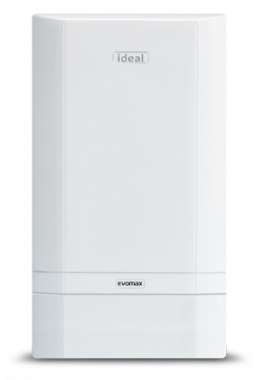 The EvoMax boiler is a condensing, regular boiler which will both heat your central heating system directly and produce hot water for your storage cylinder. The hot water cylinder will need to be fed by a cold water storage cistern which is usually located in the attic. For this reason this boiler type is not suitable for smaller properties where space is limited. This boiler has an efficiency rating of 96.9% making it an A rated boiler. It has an output rating of 60 kW which makes it perfect if you have a property with multiple bathrooms. This compact boiler offers a great deal of flexibility when it comes to where you can install it in the home as it can be either wall mounted or floor standing. This is because the optional frame and header kit offers in-line and back to back cascade options. This boiler is available as an LPG or natural gas boiler as well as a wide range of output ratings: 30kW, 40kW, 60kW, 80kW, 100kW, 120kW and 150kW. Careful component selection and a design focused on reliability enables straightforward installation and servicing. This includes variety of features such as a robust cast aluminium silicon alloy heat exchanger, high 5:1 turndown up to 110% part load efficiency and NOx <40mg/kWh (class 5) for all natural gas boilers. It has an efficiency rating of 96.7% making it an A rated boiler and has a 60kW output rating which makes it perfect for larger properties with a higher demand for heating and hot water. This unit also features a backlit display that has simple controls, giving you maximum control over the boiler. With 5 years warranty on parts and labour you can be sure that you are buying a highly reliable boiler from Ideal.